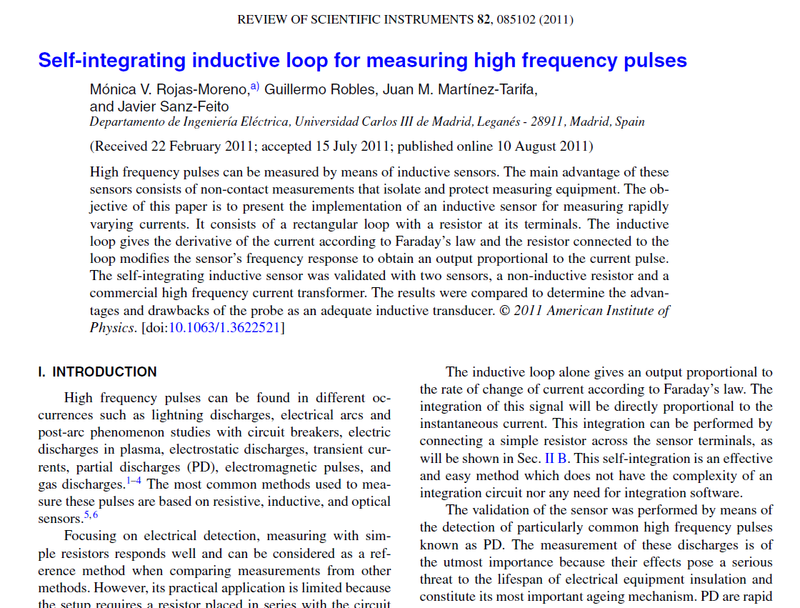 Abstract – High frequency pulses can be measured by means of inductive sensors. The main advantage of these sensors consists of non-contact measurements that isolate and protect measuring equipment. The objective of this paper is to present the implementation of an inductive sensor for measuring rapidly varying currents. It consists of a rectangular loop with a resistor at its terminals. The inductive loop gives the derivative of the current according to Faraday’s law and the resistor connected to the loop modifies the sensor’s frequency response to obtain an output proportional to the current pulse. The self-integrating inductive sensor was validated with two sensors, a non-inductive resistor and a commercial high frequency current transformer. The results were compared to determine the advantages and drawbacks of the probe as an adequate inductive transducer. 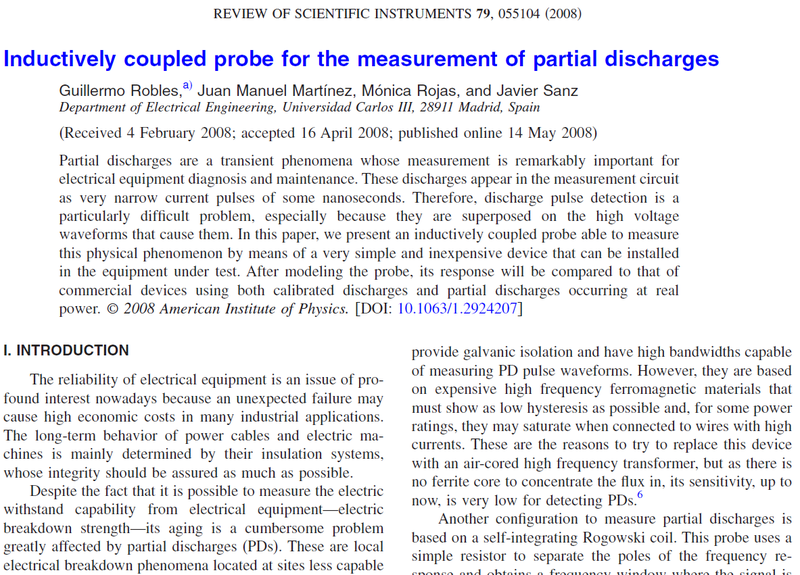 Abstract – Partial discharges are a transient phenomena whose measurement is remarkably important for electrical equipment diagnosis and maintenance. These discharges appear in the measurement circuit as very narrow current pulses of some nanoseconds. Therefore, discharge pulse detection is a particularly difficult problem, especially because they are superimposed on the high voltage waveforms that cause them. In this paper we present an inductively coupled probe able to measure this physical phenomenon by means of a very simple and inexpensive device that can be installed in the equipment under test. After modeling the probe, its response will be compared to that of commercial devices using both calibrated discharges and partial discharges occurring at real power. Abstract – In order to obtain partial discharge (PD) measurements a PD measuring probe based on a Rogowski coil was constructed. Up to now, Rogowski coils had been used to measure high level currents. In this paper, the design of a Rogowski coil to measure very low currents, but with a very high frequency, such as partial dischages, is exposed. 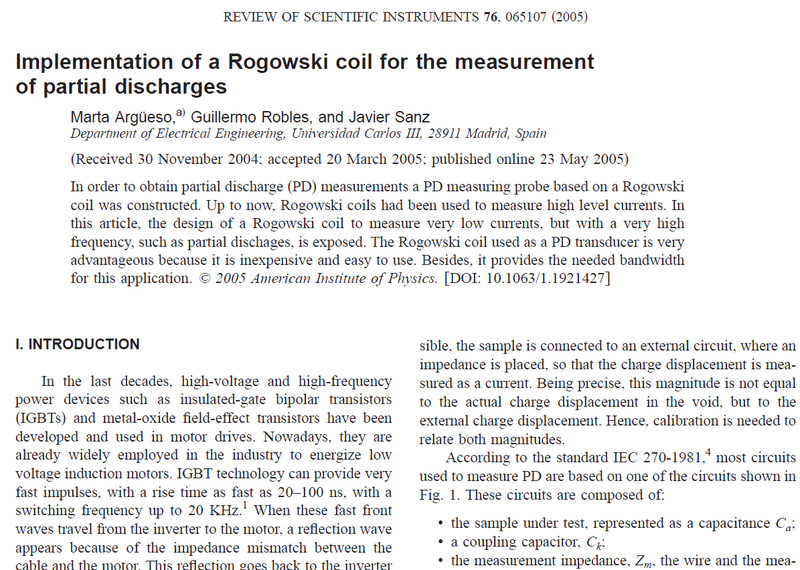 The Rogowski coil used as a PD transducer is very advantageous because it is inexpensive and easy to use. Besides, it provides the needed bandwidth for this application.